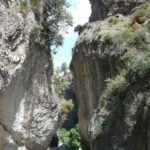 The Cahorros walk starting in Monachil takes you into a dramatic gorge with hanging bridges. In spring the meadows come alive with beautiful flowers. Monachil, which shares its name with the fast-flowing river that runs through the village, has become rather overbuilt in recent years, but is remains a convenient base for trekkers and skiers. There are several accommodation options in the village and surrounding area. Monachil is also very easily accessible from Granada.